After two months of stopping in the writing of the blog, the new topic of the cavalcade of Blogs organized by Qalo & Lolo is all indicated. Why take a break from riding? The break can be forced or not. Sometimes we are discouraged, with the feeling of stagnating and in general the pause is necessary. The moment of our life can be complicated and we all know that riding takes a big place in it. Why did I pause in my cavalier life? I’ve had several breaks. The first is when I was tired of going on a club resume, I didn’t feel like I was advancing in the direction of the horse or as a rider. So I ended my life as a club rider and turned to half board. I then paused on foot when I recovered mermaid which was unbearable. And lately I do breaks often because I do not want to ride or a problem with mermaid (type abscess which I already speak here). The benefits of a break? Taking breaks is always beneficial (or almost). They allow you to do otherwise, to question yourself, to try something else. Indeed there is so much discipline and current of thought in our equestrian world that it is enough to find the right way. We have something to do and we see things differently. Trust has been able to move more freely between me and her. And sometimes the hardest thing is to get back in the saddle because you apprehend. “I have a super hot mare and it’s 1mois I haven’t ridden.” This sentence I already thought, then finally the mare was adorable, finally adorable it’s a big word for mermaid, say rather as usual and the apprehension quickly flew away. For them too it is a holiday. A horse does not need to work. 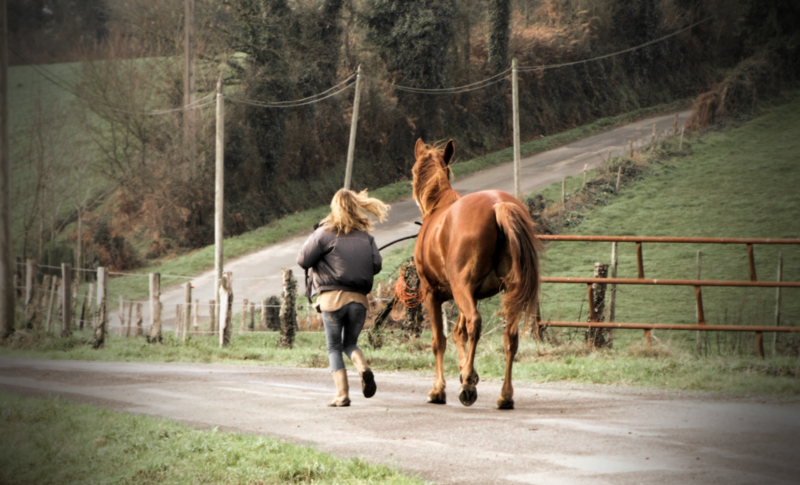 We work his horse to achieve a particular goal but if the need is to do 1h of ballad on Sunday promised your horse in the meadow will have no worries to make it. He loses muscle and cardio, like us but to a lesser extent. A recovery whether it is for the rider, the horse or the couple must be cool and progressive. We do not start with a course at 130 when we did not work for 6 months. We do not start again with the big saddle session if not good courage not to walk like Lucky Luke for 1 week. Previous PostLet’s stop seeing evil everywhere!